We were headed to Antigua, a beautiful colonial town nestled in a valley 45 minutes outside of Guatemala City, in the colorful country of Guatemala. The cobble-stoned town has wonderful architecture, artwork made by local craftsmen, fun restaurants, and lovely hotels with garden courtyards. This town offers many opportunities for travelers including volunteering in schools, taking language classes, or even building homes. When I first went to Guatemala with my mother I was twelve years old. Although I had been to a third world country before I was still nervous about what our adventure had in store. We were taking a two week language immersion course which included living with a local host family and taking one-on-one Spanish lessons. Through the talk of other travelers we learned about an inspiring non-profit called From Houses to Homes (FHTH). 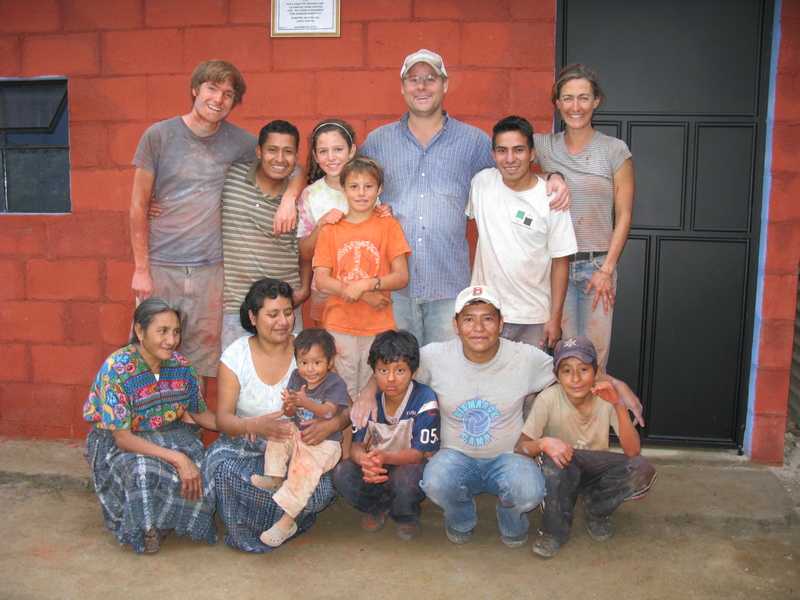 FHTH is an organization that builds homes for the poorest families in Guatemala. There are over a million corn stock homes in Guatemala, and FHTH is making an effort to change these numbers. So, the following Thanksgiving, I returned to Antigua with my mother, father, and brother to build a home. Over the course of five days, we built a house from start to finish. Working seven hours a day, we constructed a 13’x19’ cinderblock home with a locking door, cement floor and window. Alongside the receiving family, our team of seven volunteers lifted brick by brick until we painted the last stroke of paint. It was hard work, but, as FHTH says, “it is the hardest work you will love.” At the end of the week we completed the 381st home built by the organization. One of the highlights of my trip to Guatemala was building the house with the receiving family. Over time, we created such a bond. Luis, the father of the family, was quite shy, but Else, the mother, smiled as we built her home. She showed me how to weave with her loom and I also watched her do her chores such as washing laundry by hand and preparing meals over a tiny fire. The couple’s three sons- Luis, 12, Yonny, 10 and Ezrus, 2- were constant entertainment. Even for my brother and father (who don’t speak much Spanish) it was great. Whether we were playing soccer or just chatting, there was never a dull moment. Another highlight was the Key Ceremony. At the end of the five days, when the house was finished, the volunteers passed over the keys to the receiving family. It was such an emotional moment. The receiving family was crying, the volunteers were crying – all tears of gratitude. The ceremony was a the perfect way to close an amazing week of volunteer work. Traveling to Guatemala involves basic challenges similar to any third world country. Before we left the States, my parents read up on travel safety in Guatemala on the US Department of Security website. As expected, we had to be careful around food and water (FHTH provided plenty of bottled water) and when we were walking in Antigua we had to be careful with our bags. Also, it is generally recommended not to walk around late at night, so we were very cautious. The flight to Guatemala from San Francisco was easy. We flew to Los Angeles and took a six hour all-nighter on Delta, departing at 10:45 pm and landing in Guatemala City at 5:30 am. After clearing customs, FHTH greeted us to take us to Antigua. By 9am we were having a beautiful breakfast at Cafe Condessa in the town center of Antigua! It was incredible that a relatively short plane ride could take us to such a foreign land! I would recommend this adventure to families in the Bay Area who are interested in traveling to a third world country in a meaningful way. Anyone can stay in a hotel, walk the streets and buy the local crafts, but taking a trip that makes a difference to other people is a very special experience. This was also a memorable bonding time with my family. We were all working together in a way that is different than how we usually spend time together at home. * Now, Chloe is focusing her efforts towards raising money to build homes in Guatemala. Check out her website, guatemalanexpressions.com, to view her incredible photography and see how you can help. This entry was posted in Helping kids, Home Building, South America. Bookmark the permalink.